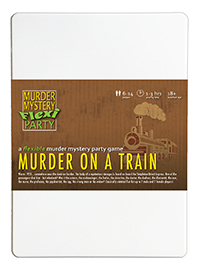 You've been invited to play the role of Jane Doe in Murder on a Train. In the coldest month of 1933, somewhere near the Austrian border, passengers aboard the Simpleton-Orient Express experience a murder that will change their lives forever! But who killed mysterious stranger John Doe? Join us to find out whodunit! You may not have planned to be a widow but fortunately you pack for every eventuality, so you wear a black mourning dress complete with black veil. You clutch a photo of your husband and a handkerchief for your tears. You were just a barmaid from the East End of London when you met your husband. He was handsome and debonair, with a glamorous life of travel and you fell in love quickly. You didn’t always fit in with his glamorous social circles but it was nothing a round of “Knees Up Mother Brown” couldn’t cure. Good evening. My name is Jane Doe and I am shocked and saddened by the devastating loss of my husband…. Oh, I’ve ‘ad enough of this poncing about! I’m not posh - never ‘ave been. I’m an East End girl through and through, with pearly buttons for eyes and cockles where me heart should be! Me and my ‘usband were in witness protection though a fat lot of good that did!